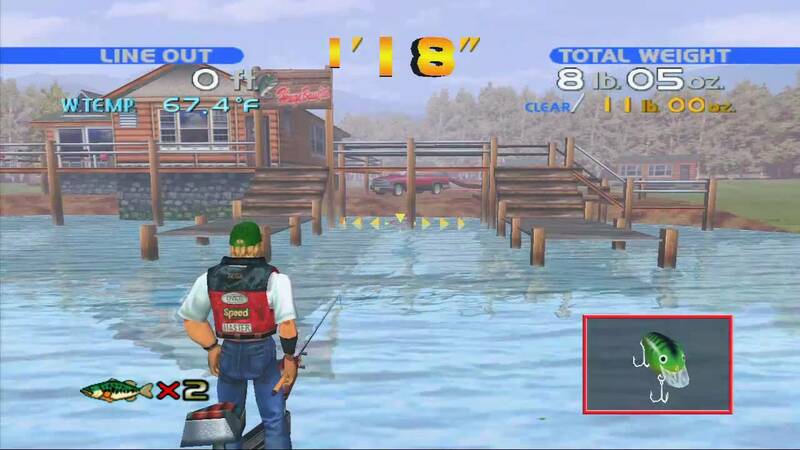 Sega Bass Fishing is a sports game that was first released in the Arcades in 1997. It consists of three modes and supports either a Dreamcast controller or the Fishing Rod. Arcade Mode plays in 1-2 minute increments and tasks you with catching enough fish to reach the required weight quota. It caters to all knowledge levels, as deciding your lure and cast point is intuitive. There's also some depth for experts, as the best results are achieved by carefully selecting the best lure based on the water temperature and time of day. Trying the numerous types of lure is entertaining (they control differently when a fish bites) and each one is like a unique mini-game! While the controller works fine, the Fishing Rod is recommended, as the physical act of reeling in and using the motion sensors makes the gameplay more enjoyable. Rather than feeling gimmicky, it's vital to the core experience and responds to small movements well, while the rumble pack provides tactile feedback to add to the immersion. My only complaint is that the camera angles don't always give you the best view of the lakes. Original Mode pits you against the CPU in four tournaments where the objective in each is to catch the heaviest total weight of fish across 3-5 sessions. The locations are different to Arcade Mode and I love how there's varying depths to the lakes depending on which lure you prefer. The challenge ramps up dramatically here though and due to the lack of skill settings you really need lots of practice to even place well in the leaderboard. The ability to Save and Load your progress is appreciated though. There's also a much-needed Practice Mode where you can customise the conditions and learn the game's nuances. 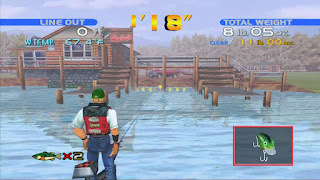 Sega Bass Fishing is an impressive title and strikes a great balance of being simulation-like, while challenging players against the clock in an Arcade-style fashion. The fact that newcomers and experts can find something to love is a testiment to the developers, and the ability to use the awesome Fishing Rod makes this a must-own. Random trivia: A sequel called Sega Bass Fishing 2 was released on the Sega Dreamcast in 2001. Labels: 1999, dreamcast fishing rod games, Ltd., sega, sega bass fishing sega dreamcast review, sega dreamcast reviews, SIMS Co.